A few more recipes and food items including Mammoth Stew. Adds a few new recipes and food items. DOES NOT add new meshes or textures. I don't have time to expand this so I am looking for a modder to continue the work. You can use this plugin as a template and add more recipes and foods. You do not need my permission. You can upload it to your own mod or I can give you permission to upload it here. 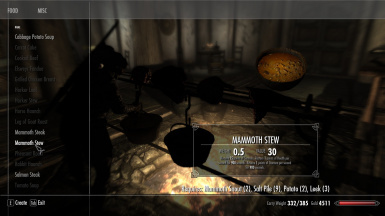 I couldn't believe there wasn't a mammoth stew in the vanilla game, so I added it to give you a health and stamina regen boost. Possible conflicts with food mods. Please edit, redistribute, and make derivative works. I would appreciate credit.